NDP Leader Jagmeet Singh says Canada should look at buying oil from countries other than Saudi Arabia as Canada's diplomatic dispute with the kingdom continues. As Canada's diplomatic dispute with Saudi Arabia heats up, Jagmeet Singh has an idea that could pour more fuel on the fire: forget the Arab kingdom and buy our oil from other countries. 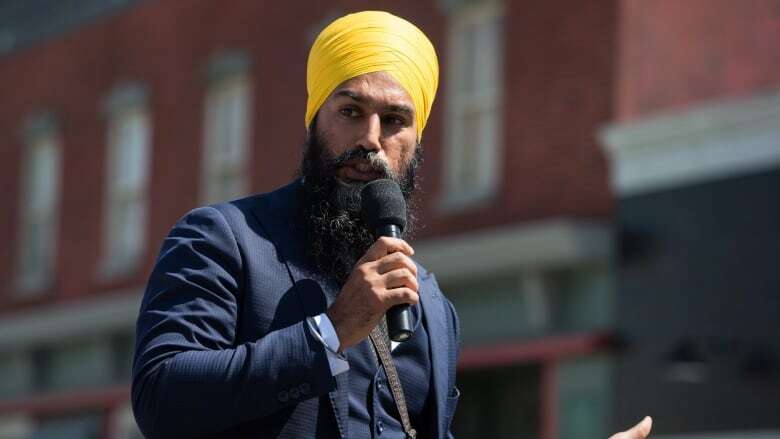 "There are other nations we can look at in terms of access to oil," the federal NDP leader told Vassy Kapelos on CBC News Network's Power and Politics today. "I think we should look at that as an alternative to dealing with a nation that has a serious track record of human rights violations, oppression of women, oppression of those who have voiced criticism of the government," he said. "We should take a hard look. Does it make sense for us to continue to have trade relations with a country that has such a bad track record?" According to the National Energy Board, 11 per cent of the oil Canada imports came from Saudi Arabia in 2016. The kingdom is Canada's primary source of overseas oil imports (not including the United States). Other countries Canada imported oil from in 2016 included Algeria, Nigeria, Norway, Kazakhstan, Azerbaijan and the United Kingdom. Singh did not say which suppliers he thinks Canada should turn to as an alternative to Saudi Arabia. Singh made the case for boosting Canada's refinery capacity, but demurred when asked whether that should extend to building more pipelines here. "It requires refineries first and foremost. I think that's the priority," said Singh, who has opposed publicly both the Trans Mountain and Energy East pipeline projects. "Being sovereign when it comes to our oil would mean having the capacity to refine here in Canada." No new refineries have been built in Canada in 30 years, with the exception of Edmonton's Sturgeon refinery built in 2017, according to a 2018 NEB overview of Canadian refineries. Between 2005 and 2013, three refineries closed in central and Atlantic Canada. While Canadian production of crude oil has increased since 2000, refinery production has dropped nearly 15 per cent between 2004 and 2015. Singh made the comments a day after announcing his bid for a seat in the riding of Burnaby South in British Columbia. The seat will be up for grabs after NDP MP Kennedy Stewart resigns to run for the Vancouver mayor's office. Although the Ontario-based Singh has committed to moving to the West Coast if he wins the byelection, he's not house-hunting just yet. That's because while Burnaby South is currently an NDP riding, it's far from safe: Stewart won by a margin of just 547 votes in the 2015 federal election. "I made a commitment that if we win, I'm definitely going to move out ... it's a beautiful community," Singh said. "My commitment is to be a national leader, and as a national leader I have to represent every part of this country," he told Kapelos. "And the issues of Burnaby South are really national issues as well." He also insisted his Burnaby bid has nothing to do with pressure from his own party to secure a seat in Parliament after spending the last 10 months since his leadership win largely absent from Ottawa. "For me, it's always been about people and how we can best represent people and their needs," said Singh. An earlier version of this story said there were no refineries built in Canada in the last 30 years. In fact, the Sturgeon refinery northeast of Edmonton began operations in late 2017.